At the time of the discovery of X-ray diffraction, the knowledge of the structure of metals was limited to what could be revealed by optical microscopy. From the occasional occurrence of metallic crystals with well defined plane faces, it was recognized that the structure of metals was essentially crystalline. Little but speculation existed as to the actual atomic arrangement, although the geometrical theory of space-groups and space-lattices had been laid down long before the detailed atomic arrangement could be determined. The general principles of metallic phase diagrams had been established by Roozeboom and others, and the experimental work of Heycock and Neville (1897) had shown how the limits of the different phase fields could be established to a high degree of accuracy, even in very complicated systems. At the same time the German School under Tammann had produced a rapid survey of a number of metallic equilibrium diagrams, but the underlying structures remained a mystery. The application of microscopical methods to the study of steels had resulted in the recognition of a number of 'constituents,' but confusion often existed as to whether these were distinct phases with definite crystal structures, or were mixtures of phases on a scale too fine to be resolved by optical methods. The general position was, therefore, one in which further progress depended on the discovery of some method by which the detailed atomic arrangement in metals could be revealed. * The following review has been written at short notice at the request of the Editor. The time available did not permit any systematic searching for references, and the paper should be regarded as a brief commentary on those applications of X-ray diffraction to metallurgical problems which happen to have attracted the author's attention. At the outset, therefore, an apology must be offered to the many investigators to whose work no reference is made, even though their contributions to the science were considerable. The importance of the discovery of the diffraction of X-rays by crystals was recognized from the outset, but its application was delayed for several years by the First World War. Early work by Davey, Hull, and others led to the determination of the crystal structures of many of the more common metals and, owing to the difficulty of obtaining single crystals of metals, the Debye-Scherrer, or powder method of crystal analysis was specially attractive - indeed it was devised by A. W. Hull independently of, and nearly simultaneously with Debye and Scherrer for the purpose of structure determinations of metals. The original discovery of this method was made in 1916, and from 1920 onwards cameras of various types began to make their appearance, and their application to many metallurgical problems resulted in spectacular advances in the decade 1920-30. It was soon established that the majority of the metals crystallized in one of the three typical metallic structures shown in Fig. 12-2(1). These are the face-centred cubic, close-packed hexagonal, and body-centred cubic structures. Allotropy is common, particularly among the transition metals, and in nearly all such cases the body-centred cubic modification is the form stable at the highest temperatures. This is because the relatively open nature of this structure results in abnormally large amplitudes of thermal vibrations in certain directions relative to the crystal axes. The corresponding entropy term in the expression G = U -TS + PV is thus large at high temperatures, and tends to lower the value of the free energy, G, and so to make the body-centred cubic structures more stable. Fig. 12-2(1). The three typical metallic structures. The older work on the constitution of alloys had led to the conclusion that many metals formed solid solutions* in one another. This was confirmed experimentally by the work of Bain, and of Owen and Preston, who showed that the diffraction patterns from a solid solution resembled that of the parent metal, but that the formation of a solid solution was accompanied by a change in the lattice spacing. 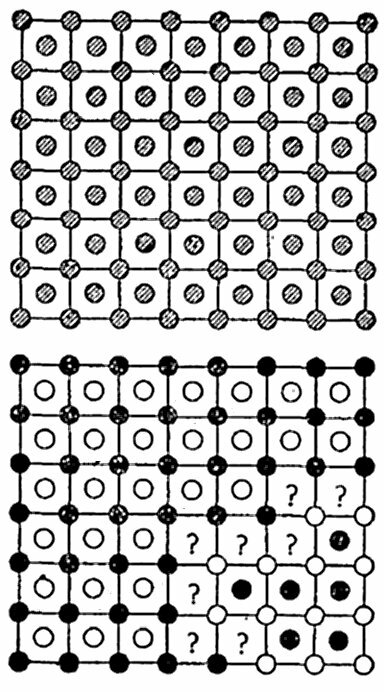 Combination of lattice spacing measurements and density determinations enabled a distinction to be made between interstitial solid solutions in which small solute atoms entered the interstices between the larger solvent atoms, and substitutional solid solutions in which solute atoms replaced those of the solvent so that the two occupied a common lattice. * The term mixed-crystal was also used. The elements most concerned in interstitial solid solutions are hydrogen, boron, carbon, and nitrogen. The effect of the relative sizes of the constituent atoms is well shown by the case of silicon which forms substitutional solid solutions in iron and copper whose atomic diameters are about 2.5 Å, but an interstitial solid solution in niobium of atomic diameter 2.9 Å. In 1920, metallurgical science was concerned mainly with alloys of the metals of industrial importance, and it was fortunate that these included iron, copper, and aluminium. The element iron is unique in that body-centred cubic structures are stable at high (δ-iron) and low (α-iron) temperatures, with a face-centred cubic modification (γ-iron) stable in the range 910°-1390°C. The properties of steels depend largely on the fact that, owing to the different sizes of the interstices between the iron atoms, carbon is much more soluble in γ- than in α- or δ-iron. Ordinary steels (plain carbon steels) may be regarded as impure iron-carbon alloys with carbon contents in the range 0.1-1.5% carbon by weight together with small quantities of other elements - when relatively large proportions of other metals are deliberately added, the steels are known as alloy steels. The methods of optical microscopy had shown that in plain carbon steels most of the carbon is present in the form of a metastable carbide of iron, Fe3C or cementite, and a suspicion existed that other carbides might be formed when hardened or 'quenched' steels were tempered, whilst carbides of other metals were known to be present in some alloy steels. The application of X-ray methods to the problems of these steels began with the X-ray diffraction work of Hägg, and of Westgren and Phragmén. The solid solution of carbon in γ-iron was shown to be of the interstitial type and, on slow cooling, the γ-iron changes to α-iron whilst the carbon atoms form cementite whose unit cell was determined as early as 1922 by Westgren and Phragmén. With rapid cooling, the γ→α change takes place too quickly to permit the formation of cementite, and the carbon atoms remain trapped in the interstices of α-iron, whose unit cell is distorted to a body-centred tetragonal unit with the carbon atoms in what are called the octahedral interstices. The tetragonal nature of this phase, martensite, was established in 1926, by Fink and Campbell and, independently in 1927 by Seljakow, Kurdjumow, and Goodtzow, but it was not until much later that the details of these structures were determined. The writer remembers a meeting of the Iron and Steel Institute in 1940 at which the late Dr. Hatfield complained that the crystallographers could not say where the carbon atoms were in cementite. Whereupon Sir Lawrence Bragg pulled an invisible string, and Dr. (now Professor) Lipson rushed to the platform and produced the answer. 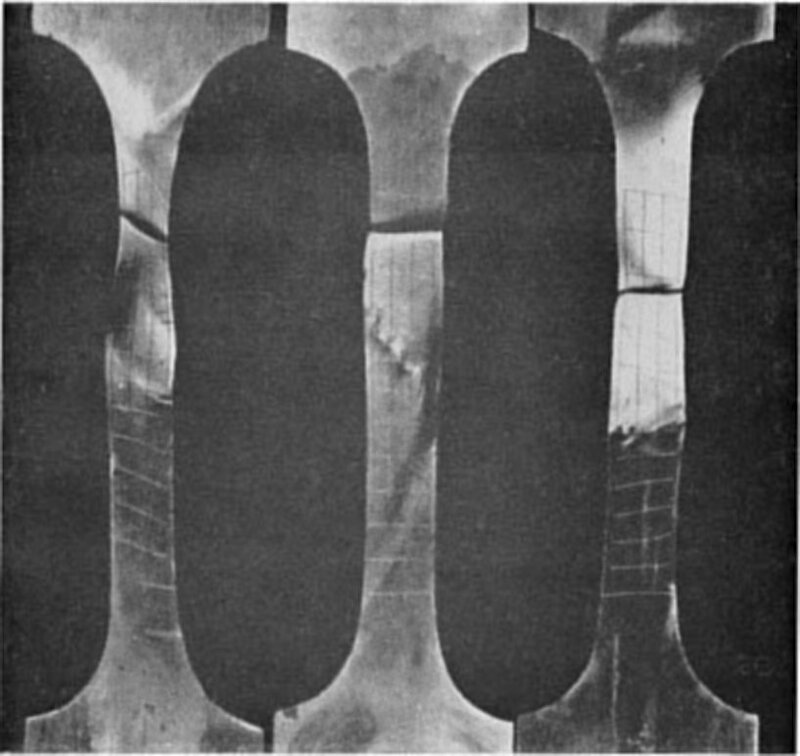 In the years between the two World Wars X-ray methods established the structures of many of the carbides which were of importance in connection with ferrous metallurgy. In this work many ingenious methods have been used. In some cases, if steels are treated with suitable acids - either directly or electrolytically - the iron matrix can be dissolved, and the carbides left as an insoluble residue which can be submitted to chemical and X-ray analysis. This method has been of great value, but has the obvious disadvantage that the carbide itself may be attacked by the acid. Methods were devised by K. H. Jack, in which nitrides of iron were first prepared, and were then treated with carbon monoxide which resulted in the formation of an iron percarbide, Fe20C8; this had originally been obtained by Hägg, and its composition has at different times been regarded as Fe2C and Fe20C9. It is a metastable carbide which is of interest because it is formed as an intermediate product in the tempering of martensite. Carbon is the most important of the interstitial elements in steels but nitrogen, whose atomic diameter is slightly less than that of carbon, is able to form an analogous series of alloys. Nitrogen, like carbon, is more soluble in γ-iron than in α-iron, and nitrogen martensites can be obtained with the same general characteristics as carbon martensites. The smaller atomic diameter of nitrogen has the interesting effect of permitting the formation of hexagonal iron nitrides, in which the iron atoms occupy a close-packed hexagonal structure with nitrogen atoms in the octahedral interstices. The very beautiful X-ray work of Jack has led to the discovery of a whole series of iron-nitrides, the characteristic of which is that the nitrogen atoms arrange themselves in the octahedral interstices of the metallic framework, in such a way that the nitrogen atoms keep as far away from one another as possible. If these nitrides are treated with carbon monoxide, some of the nitrogen is replaced by carbon, with the formation of hexagonal carbo-nitrides of composition ranging from Fe2(C,N) to Fe3(C,N). It is not possible in this way to obtain a pure hexagonal iron carbide, but hexagonal or ε iron carbides are formed as intermediate products in the tempering of some steels, and may be regarded as the end products of the carbo-nitrides which are derived from the nitrides. The work on iron-nitrogen alloys has been of outstanding value because, apart from its direct bearing on the problem of nitrogen in steels, it has led to a greater understanding of the carbides of iron. All these carbides are metastable when compared with the stable system iron-graphite, and according to Jack their free energies are in the order ε carbide > iron percarbide > cementite. The work on iron-nitrogen alloys has also led to the discovery of two nitrides of great structural interest. The first of these is γ-iron nitride, Fe4N, whose structure is shown in Fig. 12-3(1). Here the iron atoms occupy a normal face-centred cubic lattice with a nitrogen atom at the centre of each unit cube. 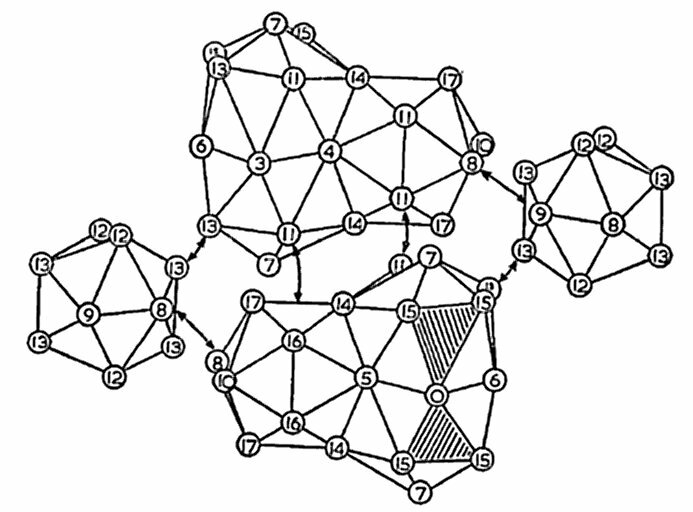 The nitrogen atoms thus occupy octahedral interstices and arrange themselves so that, when a particular interstice is filled, both the nearest and second nearest octahedral interstices are unoccupied. A further iron nitride, Fe8N, is formed as an unstable intermediate constituent in the tempering of nitrogen martensite, and has the remarkable structure shown in Fig. 12-3(2). 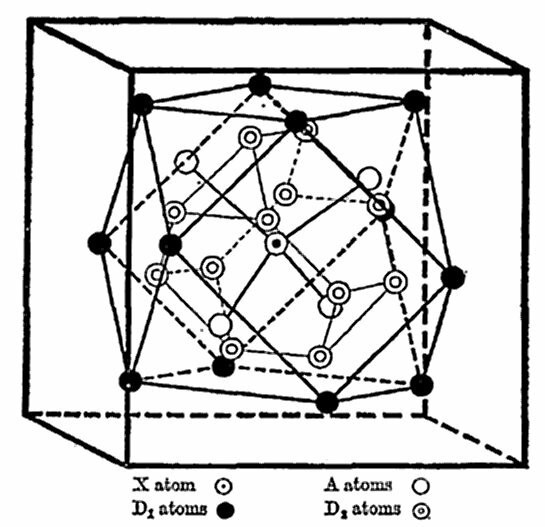 This may be regarded as a highly distorted martensitic structure in which only 1 in 24 of the interstices are occupied by nitrogen atoms but, in spite of this extreme dilution, the arrangement is perfectly regular, and examination of the diagram will show the fascinating way in which the larger and shorter distances between the iron atoms compensate for each other. In ordinary carbon and nitrogen martensite, the proportion of interstitial atoms is smaller than in Fe8N, but Fig. 12-3(2) gives some idea of the local distortion which will surround each interstitial solute atom. Fig. 12-3(2). The structure of tempered nitrogen-martensite (α''). °, iron atom; •, nitrogen atom. From K. H. Jack, Proc. Roy. Soc. A 208, 218 (1951). The methods of X-ray diffraction have led to great advances in the knowledge of the constituents present in steels, and of the processes occurring during the various heat treatments to which industrial alloys are submitted. The information gained in this way is now being supplemented by the methods of electron microscopy and electron diffraction, and the present time is one of great activity. In the study of copper alloys the combination of X-ray diffraction methods with those of the older techniques led to the foundation of the first general theory of alloy structures. In alloys such as those of copper-zinc, copper-aluminium, and copper-tin it was obvious that the copper-rich parts of the equilibrium diagrams were of the same general form (Fig. 12-4(1)) although the compositions at which the various phase boundaries occurred were quite different. In 1926, it was shown by the present writer that the body-centred cubic β-solid solutions in these alloys, although of variable composition, occurred at roughly a ratio of 3 valency electrons to 2 atoms (e.g. CuZn, Cu3Al, Cu5Sn), and it was suggested that, in some of these intermediate phases, structures might be characterised by constant electron/atom ratios. This idea was taken up enthusiastically by Westgren and Bradley, and it was established that electron/atom ratios, or electron concentrations, of 3/2, 21/13, and 7/4 were characteristic of structures of the body-centred cubic, γ-brass, and close-packed hexagonal types. It was, further, shown that ternary and quaternary alloys with these structures could be obtained, provided that the atoms were mixed together so that the characteristic electron concentration was preserved. Intermediate phases of this type were known as electron compounds, and it was by a combination of X-ray diffraction methods with the older techniques that the principles underlying this type of inter-metallic phase were revealed. Fig. 12-4(1). 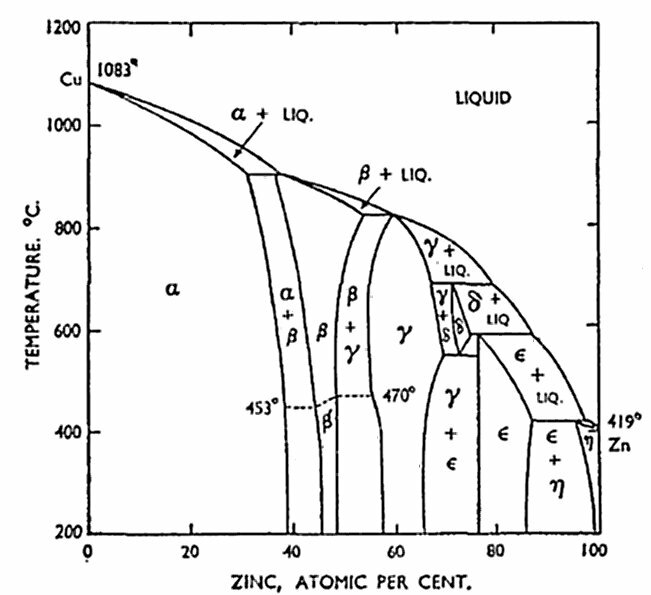 Equilibrium diagram of the system copper-zinc. The industrial applications of aluminium alloys led to the development of three distinct types of X-ray diffraction work. The element is of relatively low melting point, and the methods of optical microscopy showed that when worked aluminium alloys were heated to comparatively low temperatures, recrystallization occurred in which an entirely new set of crystal grains was produced. The mechanical properties of the alloys depended, among other things, on the grain size, and under some conditions crystals of dimensions of the order 1 cm might be formed. A systematic study of these effects by C. F. Elam (now Mrs. Tipper) led to an understanding of the conditions necessary for the formation of large single crystals, and this in its turn led to methods for the production of single crystals of dimensions of the order 5" x 1/2" diameter. These were then submitted to deformation in simple tension or compression, and remarkable results were obtained in which the deformation of the test piece was clearly related to the orientation of the crystal relative to the axis of the specimen (Fig. 12-5(1)). In the work of H. C. H. Carpenter, G. I. Taylor, and C. F. Elam, X-ray diffraction methods were used to establish the crystal orientation, and in this way the mechanisms of deformation of single crystals of metals were determined. Similar methods for the study of slip deformation were devised by Schmidt and Boas, and by many others; they are now almost a routine operation, and it is difficult for later workers to realize the immense advance which was made in the years 1920-30, and the excitement created by those who first watched single crystals undergoing plastic deformation. Fig. 12-5(1). From Carpenter and Elam, Proc. Roy. Soc. A 100, Plate 11 (1922). A further characteristic of some aluminium alloys is that, after being heated at a suitable temperature and rapidly cooled, they may be relatively soft, but that they may gradually harden or 'age' on standing at room temperatures - in other alloys 'ageing' may require heating to a low temperature. It was soon realized that such changes were concerned with the precipitation of an intermetallic compound from solid solution, but the interesting fact emerged that the greatest hardness might be found before visible precipitation could be detected. In 1939-40 the very beautiful X-ray diffraction work of A. Guinier and of G. D. Preston led to the discovery that, in alloys where the ultimate precipitate was the θ or CuAl2 phase, the mechanism of precipitation was such that copper atoms first assembled together on (100) planes of the aluminium lattice, with the formation of what are now called Guinier-Preston or G. P. Zones. The next stage is the formation of a metastable θ' phase which, in turn, changes into the final precipitate of CuAl2. It is now recognized that in many cases of age-hardening, the process involves the formation of unstable intermediate structures, and that it is these, rather than the stable precipitate, which produce the greatest hardening effect. Although highly skilled microscopical work might often reveal or suggest the formation of intermediate phases,* it was only by X-ray diffraction that their nature could be established. A wide variety of methods has been used varying from the straightforward identification of precipitating phases by means of their diffraction patterns, to the low-angle scattering techniques, first advanced by Guinier in 1939, in which the size of precipitated particles is estimated from scattering effects analogous to those by which a halo round the moon is produced from the scattering of light by small crystals of ice, or drops of water. * M. L. V. Gayler was able to reveal the existence of G. P. zones by very careful etching of the alloys and high magnification work by optical microscopy. The interest in the deformation of single crystals of metals in tension or compression led naturally to an examination of the behaviour of metal crystals in the industrial operations of rolling, drawing, swaging etc. Many metals and alloys were examined, and it was soon established that most processes of the working of metals produced material with a pronounced preferred orientation of the crystal, with the result that the mechanical properties might vary greatly in different directions relative to that of the deformation. These preferred orientations are shown by means of 'pole figures' of which Fig. 12-6(1) is an example. Fig. 12-6(1). Pole figures for aluminium sheet cold-rolled to 96.4 per cent reduction in thickness. (a) (100). (b) (110). (c) (111). R.D. = rolling direction; T.D. = transverse-direction (Grewen and Wassermann, Acta Met.). From A. Taylor, X-ray Metallography, New York, John Wiley & Sons. From the problem of preferred orientation, it was a natural step to consider the structure of deformed metal itself. 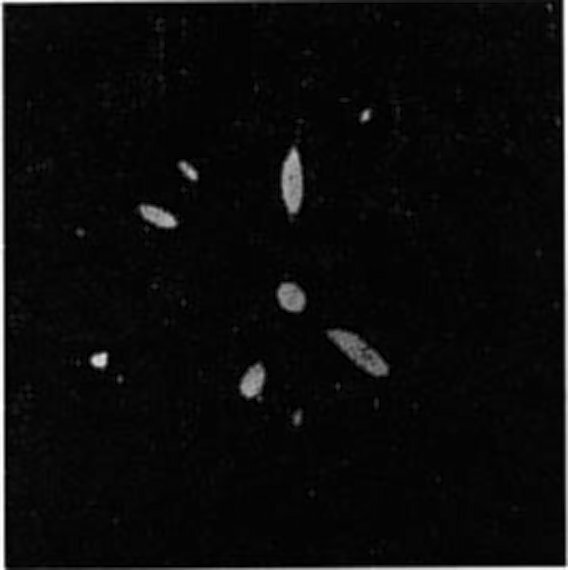 In powder X-ray diffraction films of cold worked metals, the diffraction lines are diffuse, and in single-crystal photographs some of the spots may be elongated (asterism, Fig. 12-6(2)). There was acute controversy as to whether these effects were due to a reduction of the particle size of the worked metal, (crystal fragmentation), or to a distortion or bending of the crystals. From the fact that there was a limit to the extent to which diffraction lines were broadened, it was argued correctly that there was a limit to the extent to which fragmentation occurred, but the attempts to estimate particle size from line broadening were incorrect and it was soon realized that most of the broadening resulted from distortion and bending of the crystal. This position was reached by the beginning of the Second World War, and further progress was delayed both by the War and by the fact that nearly all work was carried out with films. The later development of counter X-ray sets greatly increased the experimental possibilities, since line profiles could be measured to a much higher degree of accuracy, and permitted more complex problems to be attacked. The structures of deformed metal have been the subject of much work, and interpreted from the standpoint of the dislocation theory referred to below. Fig. 12-6(2). Laue diffraction photograph of deformed single crystal of aluminium. In the work just described, the deformation of the crystal structure is produced by intentional deformation of the metal. Another problem of even greater importance was that of the degree of perfection of ordinary unworked metallic crystals. The investigations referred to above revealed the mode of deformation of single crystals, but calculation showed that the strength of these was very much less than would be expected on theoretical grounds. Measurement of the intensities of diffracted X-rays, and of the range of angles over which a reflection was observed, led to the conclusion that, whilst a diamond crystal was reasonably perfect, metallic crystals consisted of small units which were slightly out of alignment with one another. Various theories of mosaic crystals were advanced, some of which were incorrect, but the evidence for lack of perfection was conclusive, and in 1934 the concept of dislocations was advanced independently by G. I. Taylor, Orowan, and Polanyi. In the years 1945-60 spectacular advances were made in the theory of dislocations, and X-ray diffraction methods have played their part in this work, and it is now realized that the mechanical and many other properties of metals depend as much on the imperfections as on the perfect or ideal crystal structures. In this work the development of micro-beam techniques has been of great value, since these permit very small areas to be submitted to the X-ray beam, and differences between small adjacent areas can be examined. It may, for example, be possible to show that two adjacent areas of what appears to be a 'single crystal' have slightly different orientations, and in studies of a quite different nature, the method may permit the identification of individual particles in a microsection. Another method for revealing irregularities in the structure of what may at first seem to be single crystals is due to Berg and Barrett, and the underlying principle is indicated in Fig. 12-7(1). 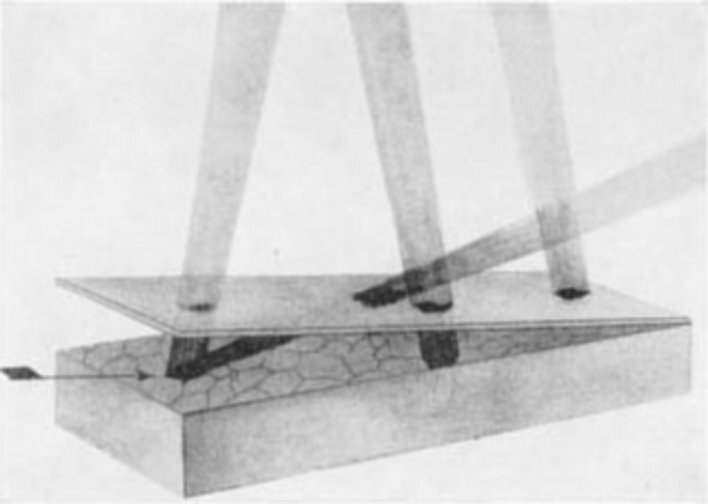 In this figure a beam of X-rays proceeding from the left is shown striking the surface of a polycrystalline specimen on which rests a photographic plate tilted at a small angle. Occasional crystals will then satisfy the conditions for X-ray reflection, and the reflected beams will pass through the photographic plate as shown. If the crystals are perfectly uniform in structure, each will give rise to a perfectly uniform image, but slight variations in orientation will produce corresponding variations in the intensity of the reflected beam. Fig. 12-7(1). Images formed by reflected rays penetrating a photographic plate placed above a polycrystalline sample. Primary beam indicated by arrow. From C. S. Barrett, The Structure of Metals and Alloys, New York, McGraw-Hill Book Company, Inc. The tremendous increase in metallurgical research work which began about 1920 led to increasing recognition that, even where an industrial alloy was not in a state of thermodynamic equilibrium, a knowledge of the relevant equilibrium diagram was of immense value. In the years 1920-40 a considerable proportion of metallurgical research work was concerned with the establishment of these diagrams. X-ray methods were applied to this problem, and it was shown that in many cases an accurate determination of phase boundaries is possible. In this work specimens of poly-phase alloys are annealed to equilibrium, and the lattice spacings of the different phases are measured accurately, and from the results the compositions of the phases in equilibrium can be deduced if the lattice spacing/composition relations are known for the phases concerned. Accurate lattice spacing measurements were thus of great importance, and A. J. Bradley first showed how the errors of the ordinary Debye-Scherrer method could be greatly reduced by the use of extrapolation methods. The original cos2 θ plot of Bradley has now been replaced by that of the more general Nelson-Riley function, but it was the pioneer work of Bradley which was responsible for the first real step towards increased accuracy. Focussing cameras and back-reflection cameras have also been employed, and it is not difficult for an individual worker to obtain lattice spacing results which are consistent to 1 part in 50 000. The absolute accuracy of these measurements is, however, a matter of much greater difficulty. A test was recently carried out by the International Union of Crystallography in which samples of three standard substances were sent to 16 different laboratories for a determination of the lattice spacings. The results submitted showed a scatter of the order 1 part in 10 000, although all the laboratories concerned considered their values to be far more accurate than this. The cause of the differences has not yet been established, but it is clear that the real accuracy is not as great as had been imagined. With the advent of counter diffractometers, claims have been made to determine lattice spacings to a greater degree of accuracy, but it has not yet been shown how close an agreement can be obtained between results from different laboratories, and tests of this kind would be very welcome. For most problems of equilibrium diagram work, the lattice spacings can be measured to a degree of accuracy which is as great as is justified by the other factors concerned. There are, however, many experimental difficulties, and it was largely owing to the work of E. A. Owen that techniques were developed which were satisfactory. The development of these methods led in turn to an improvement in the accuracy of results obtained by the older methods of thermal and microscopical analysis, and the whole standard of equilibrium diagram work was raised. Much argument and violent controversy took place between the supporters of the old and the new techniques, and extreme opinions were expressed which varied from dogmatic assertion that the X-ray methods could deal only with diagrams for which the answers were already almost known, to the equally extreme view that equilibrium diagrams should be determined almost entirely by X-ray methods, with microscopy and thermal analysis for purposes of confirmation only. The conclusion eventually reached was that the old and new methods were best used in conjunction, and many papers now appear in which each method is used for the part of the diagram for which it is best suited. In the equilibrium diagram determinations referred to above, most of the work was carried out on specimens quenched from the temperature at which equilibrium was being investigated. This meant, naturally, that the methods became unreliable when transformation in the solid phases took place so rapidly that changes occurred during the quenching process. Much interest therefore attached to the possibility of accurately controlled high-temperature X-ray diffraction work. Crude apparatus for this purpose had long been available, the most notable achievement being that of Westgren who in 1921 showed that γ-iron had a face-centred cubic structure. In this work an electric current was used to heat an iron wire in an ordinary Debye-Scherrer camera, and the temperature estimated roughly by optical pyrometry. In 1930-40 a number of more accurate cameras were developed, notably by Bradley and Jay, Hume-Rothery and Reynolds, and by A. J. C. Wilson, and some of the ideas of these early instruments have been incorporated into cameras which are now available commercially. The difficulties of accurate high-temperature X-ray diffraction work are often very great. Powders of many alloys can be heated in thin-walled sealed tubes of silica, and in this way experiments at temperatures up to 1000°C may be carried out under conditions in which the composition of the specimen is reasonably controlled. Unfortunately many alloys react with glass or silica, and no alternative containing tube is yet available, whilst temperatures of lOOO°-1100°C are the highest that can be used with silica capillaries. For pure metals the method of Westgren referred to above can be used, and R. Ross in the author's laboratory has taken successful diffraction films from tungsten wire at temperatures up to 3200°C. Pure metals in the form of wire specimens can also be heated in platinum wound furnaces, and Basinski and Christian described a pressurized camera for the purpose. 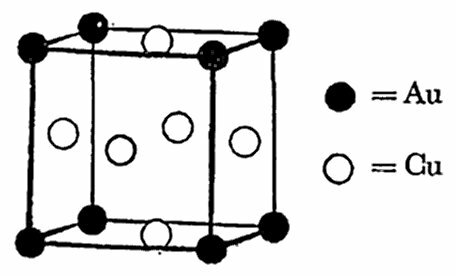 The apparatus was used successfully to determine the structures of the high-temperature allotropic forms of manganese (δ-Mn b.c.cube; γ-Mn f.c.cube), and to determine the lattice expansion of iron at temperatures above the A4 point (1390°C). For alloys, the control of compositions at very high temperatures becomes increasingly difficult because preferential evaporation of one constituent is often serious, and the composition cannot be controlled. For many theoretical purposes the properties and structures of metals at low temperatures are of greater interest than those at high. Many devices have been used in order to obtain X-ray diffraction photographs from specimens at low temperatures. Of these, one of the most simple is to allow a cooling liquid (e.g. liquid air) to stream over the specimen, and the author remembers a visit to the Royal Institution where he saw the figure of Dr. (now Professor Dame Kathleen) Lonsdale appearing through a cloud of mist, like a glorified spectre of the Brocken, while her assistant pumped liquid air over a crystal. More refined apparatus of this kind has been used with liquid helium, whilst an alternative method is for a metallic specimen to be fixed in a holder of copper the other end of which is immersed in liquid helium. Several cameras have been described in which the specimen is cooled by a stream of gas. Cameras of the focussing type have also been used with the crystalline powder stuck to the arc of the camera the other side of which was cooled by liquid air. One of the more spectacular results of low-temperature X-ray diffraction work was the discovery by C. S. Barrett in 1947 that, at low temperatures, the body-centred cubic structure of lithium was transformed into close packed modification; sodium was shown later to undergo analogous changes. - Work by Lonsdale and others on diffuse streaks has led to an estimation of the temperature variation of the root-mean square value of the amplitudes of the thermal vibrations. In the simple X-ray work described in 12.3 and 12.4, information on solid solutions was gained from the positions of the diffraction spots or lines which, when the specimen is annealed to equilibrium, are almost as sharp as those from a pure metal. It was appreciated from the outset that the sharpness of the lines did not mean that the lattice of the solvent metal had been uniformly expanded or contracted. In a dilute solid solution each solute atom is surrounded by a distorted region in which the solvent atoms are pushed outwards if there is lattice expansion, or collapse inwards if there is a contraction. The positions of the diffracted spots or lines correspond with a mean value of the lattice spacing, and it is these mean values which are used in the phase-boundary determinations referred to in 12.9 above. A little more information can be gained from the intensities of the diffraction lines, but much more valuable knowledge has been obtained by studies of the variation of the general background scattering. In this connection the work of Averbach and Warren has been outstanding, and has provided direct evidence for the existence of irregular interatomic distances in solid solutions. The problem has, however, proved too difficult for accurate solution, and at present the results are qualitative only. The existence of the regions of distortion referred to above naturally leads us to expect that, in most cases, the lowest free energy will result if solute atoms tend to avoid each other, since the existence of two or more solute atoms as next-door neighbours will accentuate the lattice strain energy. Such 'short-range order' effects had long been imagined to exist, but it was not until the analysis of general background scattering had been carried out that direct evidence was obtained (Fig. 12-12( 1)). It has now been established that, in nearly all solid solutions, there is a short-range order, in the sense that solute atoms tend to avoid each other to an extent greater than would correspond with a random distribution. In a few cases (e.g. Al-Zn) the reverse effect is found and clustering of like atoms occurs - these are sometimes systems in which a miscibility gap occurs in the solid solution at low temperatures. It is clear that with a sufficient difference between the two kinds of atom, and with a suitable ratio of solvent/solute atoms, we might expect the ordering process to be carried a stage further, and for a long-range ordered structure to exist in which the strain energy was reduced by the two kinds of atom taking up regular positions in the lattice. Such structures are known as 'superlattices', and they were first established in 1927 by the outstanding work of Johansson and Linde in Sweden on copper-gold alloys. Both copper and gold crystallize in the face-centred cubic structure, and at high temperatures the two metals form continuous solid solutions. It had long been known that on cooling alloys of compositions in the region of 25 and 50 atomic % of gold, some kind of transformations occur at low temperatures, and there was much discussion as to whether definite intermetallic compounds were crystallizing out from the solid solution. The X-ray diffraction work of Johansson and Linde showed that for Cu3Au, the process occurring was a rearrangement of the copper and gold atoms on the face-centred cubic lattice to form the structure of Fig. 12-12(2). If the distinction between the two kinds of atom is ignored, this is a simple face-centred cube, but the regular arrangement of the atoms means that some of the forbidden reflections for the face-centred cube occur in the diffraction patterns of the superlattice. This is the simplest kind of superlattice, and the X-ray diffraction pattern contains all the lines characteristic of the random face-centred cube, together with extra lines resulting from the ordered arrangement of the two kinds of atom. Fig. 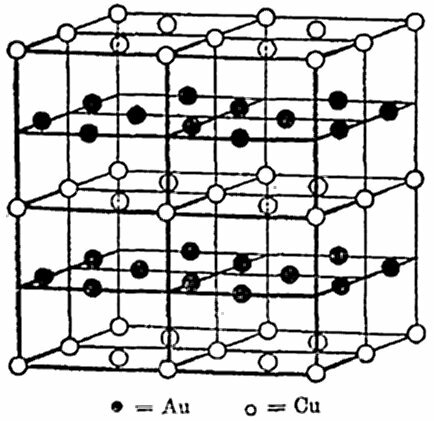 12-12 (3) shows one of the superlattice structures of the equi-atomic CuAu alloy, and here the separation of the gold and copper atoms into layers results in a slight distortion of the structure from cubic to tetragonal, and the diffraction pattern shows a splitting of the lines of the underlying face-centred cubic structure (except those for which h = k = 1) together with extra lines resulting from the regular arrangement of the two kinds of atom relative to one another. Fig. 12-12(1). Diffuse scattering in electron units for aluminium-30 atomic % zinc alloy at 400°C. Temperature-diffuse and Compton modified scattering subtracted. CoKα radiation at 22 kV monochromated with bent fluorite crystal. Fig. 12-12(2). The Cu3Au superlattice structure. Fig. 12-12(3). One of the superlattice structures of CuAu. If the formation of superlattices is regarded as a rearrangement of the two kinds of atom in order to relieve the strain energy present in a random solid solution, there is clearly the possibility that in different parts of a crystal the ordering process may begin in different ways. Fig. 12-12(4) shows this effect for a two-dimensional centred square lattice, and in such a case the crystal is said to contain anti-phase domains. The face-centred cubic structure may be regarded as resulting from the interpenetration of four simple cubic lattices, and an examination of Fig. 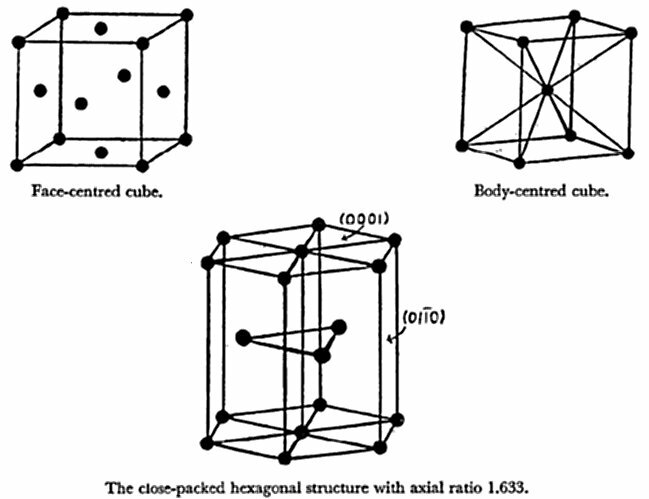 12-12(2) will show that the Cu3Au patterns in a given crystal can be formed in four different ways, according to which simple cubic lattice is occupied by the gold atoms. In such a case an anti-phase structure can be formed which is very stable for the same reason that a foam structure is stabilized. 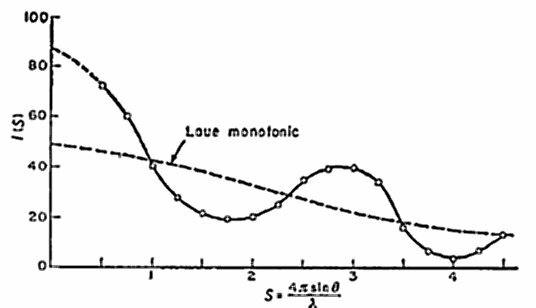 This was confirmed by the very beautiful experimental work of Sykes in which growth of anti-phase domains was accompanied by an increase in the sharpness of the superlattice diffraction lines which were diffuse when the domains were small. Fig. 12-12(4). Formation of anti-phase domains in a two-dimensional centred square lattice. Fig. 12-12(5). One unit cell of the orthorhombic superlattice of CuAu. From C. S. Barrett, The Structure of Metals and Alloys, New York, McGraw-Hill Company, Inc. The anti-phase domains referred to above are due to the ordering of the atoms proceeding independently from a number of centres. A more remarkable phenomenon is the formation of the second CuAu superlattice whose structure is shown in Fig. 12-12(5). Here the copper and gold atoms again form alternate layers, but the relative positions of these change at regular intervals so that the unit cell consists of 10 of the simple face-centred cubic cells. The reason for this regular repetition is not known. In the early days of the Science, most of the structural work on metal crystals was carried out by powder methods, whose limitations are now well recognized. In spite of the inherent difficulties of the method, great progress was made and structures of considerable complexity were determined. Fig. 12-13(1) shows the structure of α-manganese which was determined in 1925-27. The unit cell contains 58 atoms whose positions were accurately established, and when the investigator, A. J. (later Dr.) Bradley, brought the work, as a young student, to Sir Lawrence Bragg, the latter at first could not believe that the problem had been solved. At the same period Bradley, by powder methods alone, solved the structure of γ-brass (Cu5Zn8), and showed the differences between the detailed atomic arrangements in Cu5Zn8 and Cu5Cd8. In view of its early date, this work was one of the great achievements of its time. Fig. 12-13(1). The Structure of α-manganese. From Bradley and Thewlis, Proc. Roy. Soc. A 115 (1927). Taken as a whole, those concerned with the structure of alloys were strangely reluctant to adopt single-crystal methods of analysis, and there is no doubt that more rapid progress would have been made if a greater proportion of time had been devoted to the preparation of single crystals. This defect has now been recognized, and single-crystal work is now as common in metallurgical studies as in other sciences where complicated structures are concerned. Structures of very great complexity have been determined in many countries, and no attempt will be made here to summarize this work. One of the most successful investigations of this kind is the determination of the structures of the intermetallic compounds of aluminium with the transition metals, which has proceeded for many years at Cambridge under the general direction of Dr. W. H. Taylor. 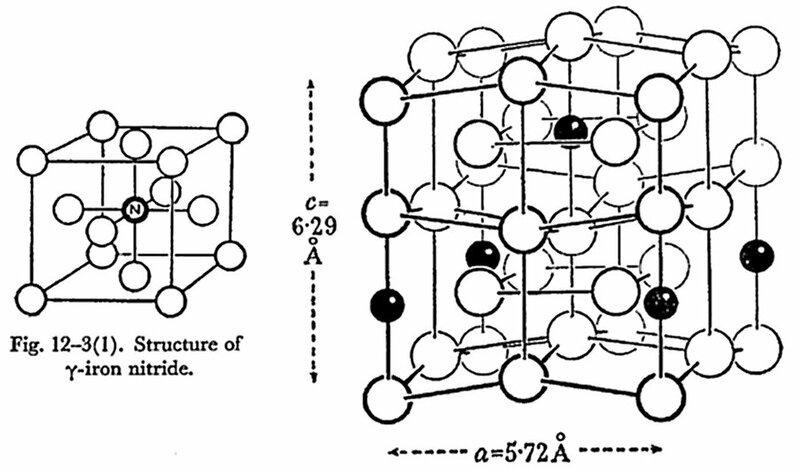 Many of these structures are extremely complicated, and mention may be made of the α' vanadium-aluminium phase of ideal composition V7Al45 investigated by P. J. Brown. The unit cell is monoclinic and contains 90 aluminium and 14 vanadium atoms. The structure may be described in terms of the coordination polyhedra around the vanadium atoms which may be divided into three classes denoted V0, V1, and V2. The polyhedra round the V0 atoms are nearly regular icosahedra, and those round the V1 atoms are slightly distorted icosahedra. Each pair of V2 atoms which are in contact form the nucleus of the two interpenetrating icosahedra shown in Fig. 12-13(2). 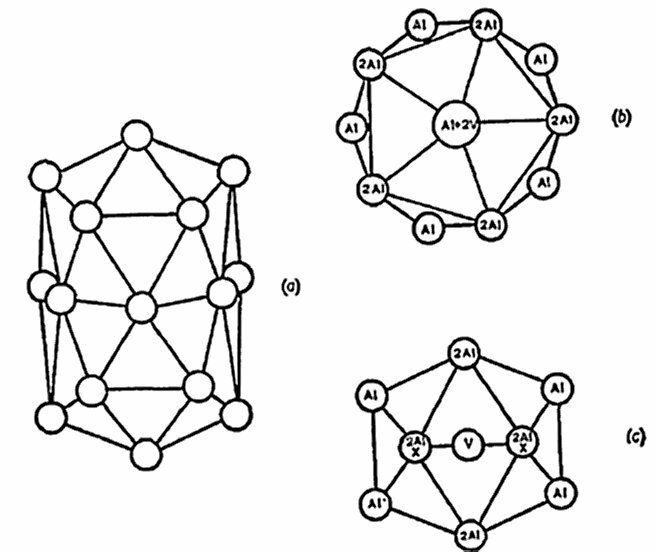 Each of these complexes shares one pair of adjacent faces with a pair of faces of one of the V1 icosahedra, and thus form the large groups of atoms indicated schematically in Fig. 12-13(3) in which the numbers refer to the different structural types of aluminium atoms. The successful determination of this structure represents metallurgical X-ray crystallography at its highest standard and, with the increasing use of electronic computers, even more complex problems will be solved. Fig. 12-13(2). Coordination polyhedra in the structure of α' (V-Al). Fig. 12-13(3). Schematic diagram showing the structural units of α' (V-Al). The numbers refer to the structurally non-equivalent types of Al-atoms. Nearly all of the work referred to in the preceding section has been concerned with the determination of the positions of atoms in the different crystal structures. In this work the structure is determined by the analysis of the diffraction patterns, and in all but the simplest cases, a knowledge of the atomic scattering factors is required. In work of a quite different kind, the known crystal structure is assumed as a starting point, and from an elaborate investigation of the intensities of the diffracted beams, attempts are made to calculate the electron density distribution which is responsible for the scattering of the X-rays, and in this way to obtain some indication of the electronic structure of the solid. The idea underlying this work goes back to the very earliest days of X-ray crystal analysis when it was found that the diffraction patterns from a diamond crystal contained some lines which would not be expected if the electron distribution of the atoms were spherically symmetrical. In this case, the atomic number of carbon is 6, and 4 of the 6 electrons per atom are involved in simple covalent bonding, and the occurrence of the 'forbidden' reflections is readily understood. Attempts to investigate the electronic structure of metals in this way were made by Russian workers under Ageev, but it is now recognized that too many approximations were involved for the measured electron distribution of the bonding electron to have been significant. All such work is of great difficulty because, in all but the lightest elements, most of the scattering is due to the inner electrons of the atoms, and the slight effect of the bonding electrons can be determined only after numerous corrections have been made, the effects of which are of the same order as the experimental errors. The difficulties and dangers of this work are well shown by the fact that one pair of American authors obtained results for iron which were in apparent agreement with the Pauling view that about two of the 3d electrons per atom were atomic, and about 6 electrons per atom were concerned in the metallic bonding. This work indicated a marked and improbable difference between iron and cobalt, and was not confirmed by later and more detailed determination by other American authors whose results were described at the Crystallographic Congress held at Cambridge in 1960. There is, however, little doubt that this kind of work is greatly needed and that, if the experimental difficulties could be overcome, the results would add greatly to our knowledge of the electronic structure of metals. It may be claimed fairly that in 50 years the results of X-ray diffraction work have revolutionized metallurgical science, At the present time every metallurgical research laboratory of note has one or more X-ray diffraction units. On the industrial side these may be used for a variety of purposes ranging from the analysis of the structures of minerals and refractories at the one end to the determination of the preferred orientation of the finished product, and the details of the age-hardening or tempering processes. On the scientific side, the first simple steps have been taken, but the possibilities are endless. It must be emphasized that there is at present only a most elementary understanding of the factors which control the formation of the different types of crystal structure of alloys. There is still great need for the systematic determination of the at present unknown structures of innumerable intermetallic phases, and for the careful study of the results obtained. The problems of the structures of liquids, and of the detailed atomic arrangements in what are usually called random solid solutions are essentially unsolved, and little or nothing is yet known of the electron distribution of the bonding electrons in metals. The present author is only too conscious of the limitations of this review, but he has felt it better not to attempt to describe subjects with which he is not competent to deal. The language difficulty has prevented more detailed reference to Russian work, and it is to be hoped that some other author may be encouraged to review the main progress in metallurgical X-ray diffraction which has resulted from work in Russian laboratories.